(CBS News) Yesterday we did a follow-up to some amazing tricks to impress your friends (or win bar bets). Today we do a follow-up to a series of awesome tips to make living easier, at least when it comes to all things beer. What can I say? We're all about tips and tricks here at The Feed, and happen to enjoy a beer now and then. Check out the beer edition version of "life hacks" above. Quick and Simple Life Hacks -- Beer Edition. 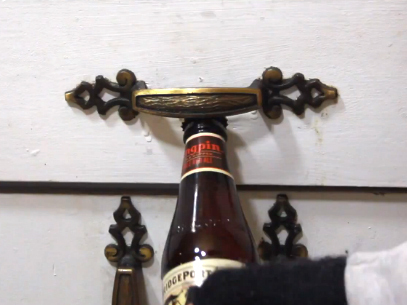 We will show you 6 ways to open a bottle just in case you lost your opener. 1. How to open a beer with a Counter Top - Place the seam of the cap along a hard edge that don't be damaged and give the bottle a hard tap right on top. 2. How to open a beer with a key - Take your car key and pop out 3 or 4 prongs in the cap twisting each time and then push up. 3. Open beer with another bottle - Flip another bottle upside down and connect the caps at the seam, leverage the upside bottle over your hand and open it. 4. Open beer with a dollar bill or paper - Take some currency and fold it over several times until its hard to bend. Then grab your bottle and place the bill under the lip of the cap. Using your knuckle as leverage pop that sucker off and make it rain. 5. Open a bottle with a drawer - Place the bottle under the lip of a handle and simply pull down in a fast motion. 6. The old lighter trick. No explanation needed. I say we all raise a bottle and toast this fun, new addition to the "life hacks" series: here's to never needing a bottle opener ever again! And if you'd like to check out more great "life hacks" from Household Hacker, you can see our previous posts here or go to his YouTube page here.